MIET AFRICA is developing facilitation guidelines and training teachers on the Life Skills component of a high school extra-curricular sports programme being run by AmaZulu Football Club. 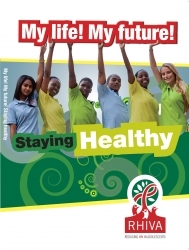 Teachers will make use of Staying Healthy, an MIET AFRICA publication aimed at adolescents, which addresses broad issues around sexual health and wellbeing. Teaching Nutrition in the Foundation and Intermediate Phases is a resource book for teachers, which includes nutrition information and CAPS compliant learner activities and worksheets as part of the Life Skills curriculum for Grade R-6. It is accompanied by three readers for learners in Grades 4-6, which address nutrition-related topics. This pack of nutrition education resources has been developed through a partnership between the South African Sugar Association (SASA), the KwaZulu-Natal Department of Education (KZNDoE) and MIET AFRICA as part of the KZNDoE Nutrition Directorate’s nutrition education programme.